... Le plus proche VUE MER, Location Appartement / Condo AU SURF-ENCUENTRO BEACH, Cabarete, à pied de la EAU! ... VUE MER, Plage Location d'appartements avec piscine tropicale jardin privé. 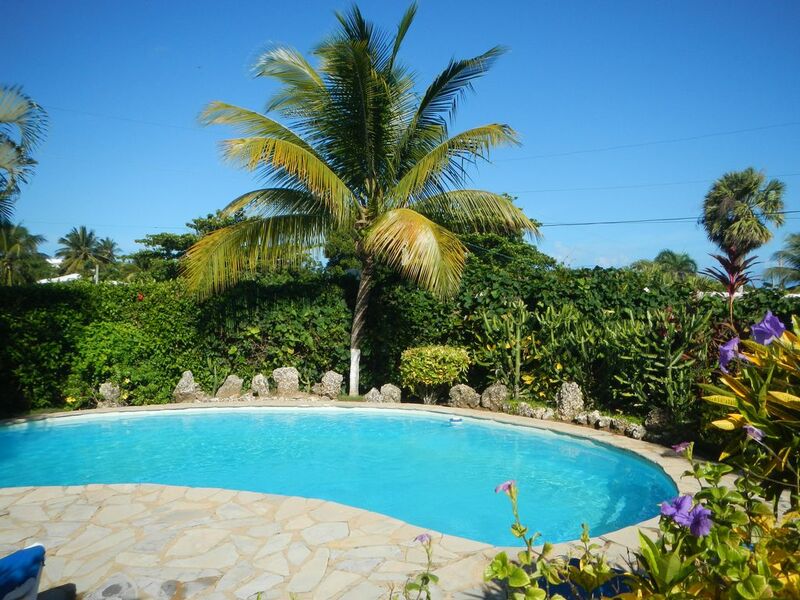 'CABARETE VACATION VILLA', APPARTEMENT D'UNE CHAMBRE / # 264139 ou Homeaway. com # 4058290 sont chacun vue sur la mer, APPARTEMENTS D'UNE CHAMBRE pour 1 ou 2 PERSONNES, CHAQUE AVEC SALLE DE BAINS PRIVÉE, CUISINE et TERRASSE OCEANVIEW --- (*** 49 $ PAR NUIT --- ***) --- *** IL Y A 3 OCEANVIEW APPARTEMENT 1 CHAMBRE / CONDO DISPONIBLE - DONC NOUS CONTACTER - NOUS AVONS UN AUTRE APPARTEMENT / CONDO DISPONIBLE *** - VOIR NOS AUTRES ANNONCES HOMEAWAY # 4058290, et un appartement studio - pour 1 personne (29 $ la nuit *** - VOIR HOMEAWAY # 4058512) --- le tout dans une villa privée et fermée de votre appartement à la plage avec le surf, le kitesurf, la planche à voile et des écoles pour l'instruction également disponibles. Encuentro Beach, Cabarete, République dominicaine est également un excellent choix de vacances pour une famille, ou deux ou trois couples ou des personnes, qui souhaiteraient passer des vacances ensemble, mais dans leur propre appartement / logement séparé, ou tout simplement un couple qui voudra peut-être un privé propriété vue sur la mer pour les vacances. Pourquoi? les appartements peuvent être utilisés par les vacanciers dans le cadre privé de la villa, offrant ainsi le niveau de confidentialité que vous désirez. Situé à seulement 10 minutes de l'aéroport de Puerto Plata Int'l. La villa est idéalement situé entre les villes de bord de mer de Cabarete et Sosua, directement entre le Coconut Palms Resort (avec son restaurant Palm Chambre située à un pâté de la villa) et de l'océan. Un quartier calme, mais proche de tout ce qu'une ville de vacances des Caraïbes a à offrir, restaurants, clubs et visites de la côte nord de la République dominicaine! Lovely place for a relaxing stay. The place is very peaceful and I felt very safe. A short drive or a 15 minute walk to the beach was easy. A short walk along the coast and you had the beach to yourself. The staff are very pleasant and were available and accommodating the one time when I needed help. Would definitely return. Thank you Colin for your review of your vacation stay, and we look forward to your returning, for another vacation, at Cabarete Vacation Apartment/Condo,at Encuentro Beach, Cabarete, Dominican Republic. Thanks again! Greg has quite a perfect location, close to the beach only a short nature hike to beach which takes about 10 minutes. There are many things to go and see that are walkable (Surfing, Fishing, Hiking, Great little restaurant down the road as well). Very safe and very special are the best ways to describe the Villa Apartments here at Encuentro Beach. I couldn't think of a better situation to recommend to couples, singles or families with small children. We stayed for several days and wish we had more time. This place is way better than any over priced hotel or large home. The weather was perfect and it was great to wake up in a very spacious, nicely laid out apartment and take a morning dip in the pool. The apartment has everything you would need and the outside courtyard area is very private and tranquil. The location is perfect and you are very close to town. The staff that Greg has (Jesus and his wonderful family) are there for your convenience 24/7 and are able to take care of anything you need whether it is a ride into town or light cooking (for a very fair and affordable fee). We cannot say enough about this property, the location and Greg and his staff (Top-notch operation). My wife and I are looking to come back for another visit in the future. Thanks Greg, Jesus and his family for making it a wonderful trip for us and we wish you good fortune! We stayed at the apartment for four days/nights and should have stayed longer. We were immediately impressed with the beautiful garden and pool area. The apartment was very clean and comfortable. Located in a lovely and quiet neighborhood, the apartment is an easy walk to the beach and in the other direction, to the main road for local transportation into town. The caretaker Jesus is just a shout-out away for extra bottled water, and affordable ride into town or anything else you may need. Jesus picked us up at the airport and took us to the bank and grocery shopping on route to the apartment. For the low key traveler who wants to relax to the sounds of the ocean instead of the sounds of nightlife, this place is for you! The grounds are blocked off by thorny plants and a large wall, you walk inside and are in a safe compound where you can enjoy a pool, small veranda, a full kitchen, and a very clean and comfortable setup. There are no frills to the set-up, but that's what makes it so awesome. Jesus the caretaker and his wife Selia (?) are both so wonderful, kind, open, helpful, and trustworthy. It was an added bonus to have them around. The place is cleaned every few days, unlimited fresh water, wifi and a walk from the beach. Thank you! Thank you very much!, for your wonderful and honest review! Yes, indeed, the vacationers/guests, that enjoy their vacation here, at Cabarete Vacation Villa Apartments/Condo, at Encuentro Beach, Cabarete, DomRep, enjoy hearing and seeing the ocean waters!, and walking to Encuentro Beach, where they can swim, surf, walk/run along the beach, or horseback ride! The property is the closest vacation rental accomodations to the surf, Encuentro Beach, Cabarete, so when vacationers return from a day at the beach, they enter the private, gated property and can enjoy the tropical pool, tiki lounge to relax, connect with WiFi Internet and either prepare a meal/snack in their kitchen, or make plans to enjoy a meal at an oceanfront restaurant (Chez Arsenio's)which is close to the property!, or simply sit on their terrace and look out to the water!, Thank you again for your review, and we await your return , for another vacation, at Cabarete Vacation Villa Apartments/Condo! I've rented this cozy apartment twice! We had a wonderful time. This is a great rental. The people are very Friendly. The rooms are Spacious, clean and beautiful. Can't wait to go back!!! It's Close to the ocean and town! All accommodations were provided. Had a wonderful time renting this beautiful apartment while staying in Cabarette. Very relaxing. Ocean and town nearby. Everyone was so friendly. Can't wait to go back !! Thank you very much, we are very happy that you enjoyed your stay!, and as you mentioned, we look forward to see you again, vacationing here!